Should You Avoid Bulleted Lists In Your Newsletters? Bulleted lists, otherwise known as ordered lists, can make text more quick to read. They allow a reader to quickly and easily read key points and convey importance or chronology. However, in your email newsletter you may want to think twice before using them. By default, browsers and email clients add a left margin or padding to an unordered list which indents it from the left margin. The problem is that different email clients render the margin or padding differently. Because different email clients have different formatting for bulleted list, formatting it for one email client may make it look even worse in another. For example, Apple Mail and Gmail render the exact same bullets differently. Apple Mail renders left padding as the space for the bullets before the text, Gmail renders the the left padding as space, before the bullets. What’s even more frustrating is that in Microsoft Outlook 2007 and newer, bullets are truncated and the margin is ignored, this means the bullets just don’t show up. Knowing that the way bullets will display is going to look different from one client to the next, you need to factor that into your design. Here at Mail on the Mark we do our best to make adjustments to our newsletter templates to target specific email clients. With use of our email client reporting, we can make sure that if you need to use bullets, they look best in which ever email client the majority of your readers are using. However, even with our adjustments understand that the bullet styles will not look the same from one email client to the next. It’s best not to try and wrap a bulleted list around an image. Even with the best styles in place, things can get weird when the lists wrap around an image. Often, what had been properly aligned bullets now run over the image. Our best advice is often to avoid using bulleted lists altogether. Consider if you really need bullets. With longer list items, we suggest creating them as separate paragraphs. You might want to bold the first few words to help the reader along. Another option is to “fake” your bullets. 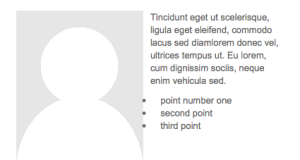 Rather than looking for the bulleted style button, add a bullet character at the beginning of a paragraph. Use bullets sparingly, and when you do use them, know they may not display universally from one email client to the next.